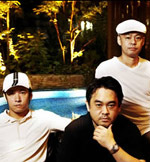 GTS is the house music unit consisting of three men: Gee, Turbo, and Satoshi Hidaka. This band, which had their 10th anniversary in 2005, has improved along with Japanese club music scene, and now their playground is global from the US, Ibiza (mecca for clubbing) to Asia. They were formed as a band under the concept "Groove That Soul" in 1995. They mainly create house music by putting the soul diva"Melodie Sexton together with different guest vocalists for each song. They became known amongst clubbers worldwide. GTS's house groove is the mixture of soulful and melodious songs, good selection for songs to cover, and groove sense which they built through DJing. The finest dance sound they create reaches way beyond Japan and finds its followers not only amongst clubbers but also amongst other music listeners who are showing a lot of support for this creative group.